My second episode was a guide to gear for podcasting, but I’ve learned a lot in the past months, so I wanted to make an updated guide. I said back then that if you couldn’t afford good gear, you should wait and save up money. I was wrong about that. I still believe that great gear will give you better sound quality which will help your show be more successful, but I don’t believe you should wait to get started. There’s so much you need to learn when you’re first starting out; great gear isn’t going to magically make the process easier. It’s best to get started with what you have, or buy what you can afford and then upgrade later. 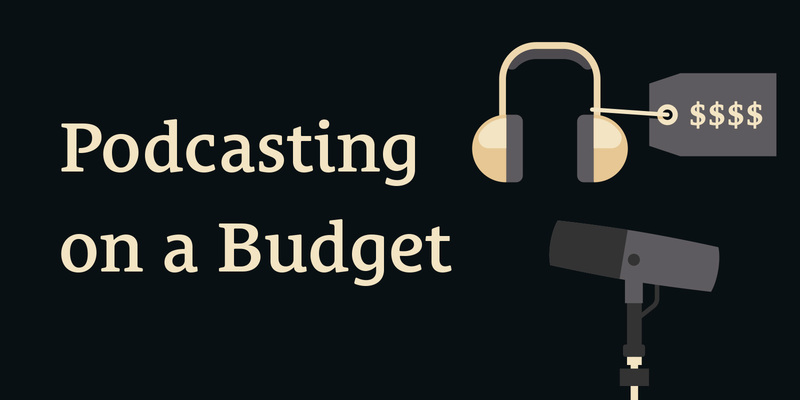 So let’s talk about podcasting on a budget. I’m going to cover gear for those of you who have little-to-no money to spend, and also share what I think is the best podcasting gear so that you’ll know what to get in the future when you have money to upgrade. If you have less than $100 to spend, pick up an ATR-2100 or a Blue Yeti USB mic. If you want to record more than one mic at a time in the same place, buy XLR mics and a USB interface with multiple mic inputs. One of the best budget setups is a Shure SM58 paired with a Scarlett 2i2 USB interface. Update: Since recording this episode, I discovered the Rode NT USB mic. This is a great deal at $169 and (I believe) the best option for solo podcasters. Great sound quality, easy to use, and has a built-in pop filter. You should still buy an additional mic stand or boom arm, though. The Shure SM7B is a great mic, but needs more gain than most mics, so you’ll want to pair it with an interface that is powered with an AC adapter instead of USB, or buy a mic preamp. You don’t need to buy expensive accessories, but every podcaster should have a boom mic stand and a pop filter. To stretch your money, buy used gear from Guitar Center, Ebay, or Craigslist. 3:07 Before I get into talking about gear, I want to emphasize this: in the end, your content is more important than having expensive gear. Great gear won’t save your show if you don’t have something to share that is valuable for your audience. 3:33 How do you make great content? By sharing what you care most about in a way that teaches, inspires, or otherwise helps someone else. I Want to Start a Podcast. What Gear Do I Need to Buy? 3:55 I’m going to cover all the gear you’ll need to podcast in this episode, but let’s start with affordable mics and interfaces. 4:08 The most affordable option is a USB headset (or earbuds that have a inline mic). I don’t normally recommend using these because they aren’t going to sound rich and full like other microphones, but it is the most affordable option to get you started. 4:41 These mics plug into your computer via a USB cable, so you don’t have to mess with buying an interface or a mixer. 4:52 The most affordable USB mic that I’ve heard that sounds decent is the Audio Technica ATR-2100 Dynamic USB Mic – $50. I used to hate on this mic because all the recordings I’d heard from people using it sounded really bad. I found out that most people were using the included desktop mic stand; they were putting it on their desks and then talking at the mic from a distance of two or three feet. That’s not how to get good sound out of a mic; you need to be within 2-5 inches of the mic to get good sound (the only exception are shotgun mics made for video). So if you do buy the ATR-2100, buy a boom mic stand and use it instead of the included tripod desk stand. 6:29 Another very common USB mic for podcasting is the Blue Yeti – $100. This is a good microphone for the price. It is a condenser mic instead of a dynamic mic, which means that it is more sensitive and will pick up more room sound and background noise. You can still get good sounding recordings from it, though. 7:28 If you want to record multiple mics to the same computer at the same time, you’ll want to buy normal XLR mics and use a USB interface to convert the analog signal from those mics into your computer. Most USB interfaces (even under $200) are pretty solid, but here are a few I recommend for build quality and sound quality. Zoom H4N Portable Interface – $199. This is a great portable recording device that can also be plugged into your laptop with USB cable. 8:39 Most affordable USB interfaces only have one or two mic inputs, so if you think you’re going to need more than one or two mic inputs sometime in the future, then buy one that has more (like the Scarlett 18i8 or the 18i20. 9:07 My favorite affordable XLR mic (hands down) is the Shure SM58/57 – $99. 9:40 If you want a cheaper option, you can go with any number of SM58 knock-offs, including Behringer’s XM8500 Dynamic Mic – $20. There’s also the Shure PG-48 (with cable and stand) – $34, which is a more affordable version of the SM58. 10:53 If you’ve got a little more money and you want to invest in some gear that will help you sound great, here are my recommendations. 11:47 The next interface I buy is going to be the Apollo Twin Thunderbolt Interface – $699 (Mac only). It’s pretty expensive, but I can dream, right? 12:14 The USB interface I’m currently using is the Focusrite Scarlett 18i20 – $499. The 18i20 has 8 mic inputs and is AC powered, which means it has a little bit more gain to give to gain-hungry mics like the Shure SM7B. 12:39 Focusrite Clarett – $499-$1299. The Clarett interfaces from Focusrite are a step up in quality from the Scarletts, but probably not necessary unless you are also going to buy a really nice mic. 12:55 If four mic inputs is enough for you, and you’re planning on buying Shure SM7B mics, then check out the Focusrite Scarlett 18i8 – $300. Like the more expensive Scarlett 18i20, it’s also powered by AC so you’ll have enough gain to power an SM7B properly. 13:27 If you need to record a lot on the go, check out the Zoom H6 – $399. 14:18 Shure Beta 87a – $249. This is the mic I’ve been using for the past few years, and I love it. Sounds great with any interface, doesn’t pick up hardly any background noise, overall just a steal for the price. 14:30 Shure SM7B – $349. I used to like this mic more, but lately I’ve been pointing people to the more affordable (and better sounding, in my opinion) Beta 87A. 15:00 Another solid mid-range mic is the Shure KSM32 – $549. It’s a condenser mic used to record vocals for many popular podcasts including Serial and This American Life. I used it for awhile and liked it, but again, I’ve been getting better results with the Beta 87A. 15:52 Mic Stand – Any cheap boom mic stand will work fine. I use this $20 mic stand from Amazon. If you want a fancy adjustable swing arm to attach to your desk, check out the Rode PSA1 or the Heil PL-2T. 16:20 Pop Filter – $10. You don’t need a fancy pop filter. Just get one. 16:38 Mic Cables – If you buy an XLR mic instead of a USB mic, you’ll need a cable to connect it to your interface. I like the XLR cables from Monoprice.com. They’re affordable and well-made. 16:48 You can mix on iPhone earbuds. Saying that will probably offend a few audio engineers, but really, most of your audience are probably listening on Apple earbuds. If you can make your audio sound good through those, you’ll be in pretty good shape. I’ve been using these $10 earbuds from Panasonic for a few years, and they’ve been great. Very close in sound quality to more expensive headphones like the Sennheiser HD600s ($300) that I also have. If you like over-the-ear headphones, check out the Sony MDR-7506 headphones – $80. They’re comfortable, rugged, and sound great. 17:50 If you’d like some cheaper studio monitoring headphones, check out the Audio-Technica ATH-M30x. – $50. 18:06 If you want good sound quality, you need to record in a quiet room that doesn’t have a ton of bare walls that will cause echo. If you’re interested in learning more about room acoustics and sound-proofing, check out episode 19 – Dealing with Room Echo and Background Noise: Sound Proofing and Absorption for Podcasters. 18:55 You’ll need software to record and edit your audio. Here are three of the best free options. Note: I’ll be publishing a free course about podcasting with Garageband later this year, but for now, if you want to learn these apps, search Youtube for tutorials, buy a course on Udemy, or sign up for Lynda.com. Audacity – Mac/Windows, free. Not my favorite, but you can’t complain too much about a free app. Quicktime – Mac only, free. Great for recording an audio file, not great for editing. 20:15 If you want to interview people or talk with co-hosts, you’re probably going to end up using Skype. I recommend always recording a file with an app on your computer in addition to recording the audio from the Skype call to have as a backup. This is known as recording a double-ender. Update: I now recommend people use Zencastr for recording interviews. It’s free (up to two guests and up to 8 hours a month) and records a local audio file for each person on the call. 22:17 Soundcloud has a free tier for podcast hosting (up to three hours of audio content). After doing some research, I discovered that after you cross that three hour upload threshold, your oldest content gets archived. That means people can’t listen to it on the Soundcloud site anymore. Will it still show up in iTunes? I’d guess so, but I’m not able to say that with 100% certainty. 22:50 My favorite hosting for podcasts is still Simplecast – $12/month. It’s the best. Unlimited hosting, free stats, and it’s easy to use. 24:02 I buy used gear nearly 100% of the time. All my mics, all my interfaces were used. I like to shop on Craigslist, Guitar Center’s used gear section, and eBay. Just choose carefully and make sure there’s a return policy in place before ordering something expensive. 29:55 Alex asked: What would a go-to setup on a budget look like? Considering the values here in the Community and seanwes, which I highly resonate with and have them as my personal values. I want to be sure I deliver awesome quality right from my first episodes. 30:16 The fact that you’re asking this question means that you’re on the right track to create an awesome podcast. As I said in the show, if you have less than $100 to spend, grab an ATR-2100 or a Blue Yeti. If you can spend $200-300, get a SM58 and a 2i2 interface. And remember that it’s ok if you don’t get everything right the first time. Focus on improving every week and consistently releasing shows and the quality will follow. 32:28 Brooks asked: What audio settings can improve the audio quality from a budget mic? 32:48 The two biggest factors are proper mic technique and proper input gain levels (loudest peaks coming in around -16 to -12db at the most). It’s also important to record in a quiet place without a lot of room echo, and learn how to use compression, EQ, limiter, and noise-removal plugins in your editing software. You can find tutorials for all these things on Youtube, or check out episode 18: Best Resources for Learning Recording, Mixing & Mastering.